MY Father did not like football, he saw it as over-rated and over-hyped. But in 1992, just a few months before he retired from his job as a social club manager, he joined in the celebrations when Denmark became European champions. 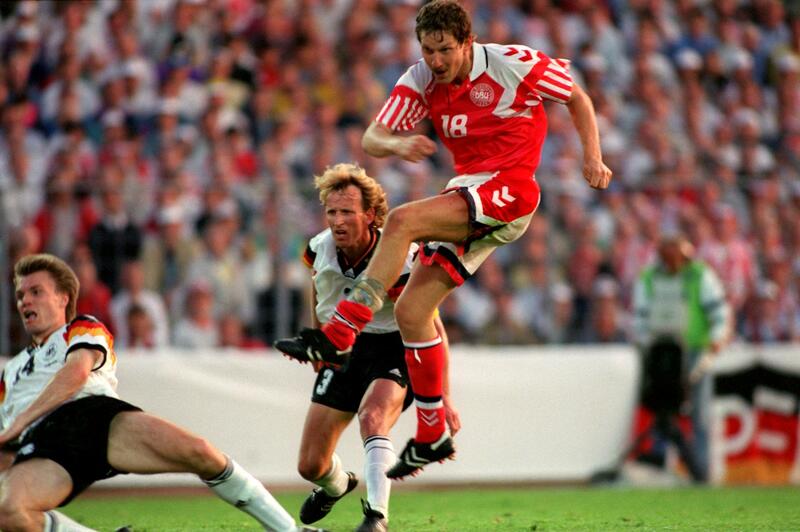 On the night that Denmark beat Germany 2-0 in the Euro 1992 final, he donned a huge Viking helmet and a red tie. He sang, “We are the champions”, which left his friends and colleagues somewhat bemused. For a brief moment, he was a Danish football fan. It was hard to believe, indeed the Danes themselves didn’t quite understand what they had achieved. Ironically, the Danish team that briefly flickered on in the World Cup six years earlier was far more exciting, so much more enigmatic, but the hastily assembled squad that had won a reprieve due to the Balkan war, was a “team for a job”. I had tipped Denmark to go close to winning the 1986 World Cup, even before they arrived in Mexico. I knew that Preben Elkjaer and Michael Laudrup were, potentially, the most dangerous front-line partnership in world football. If France had not had Platini, Denmark would probably have won the 1984 European Championship, but that’s like saying if my uncle was a woman, he’d be my aunt. The Danes of 1986 were the natural successors to the Dutch of 1974. Richard Møller Nielsen, the coach of the 1992 team and advocate of the “stubborn” 3-5-2 formation that proved to be so successful, refused to draw comparisons between 1986 and 1992 when I interviewed him in May 1996. “In Sepp Piontek’s days, we had some memorable, exciting games, but we won nothing,” he said. The summer of 1992 was a phenomenal achievement. Two weeks after they brought home the trophy from Sweden, I was in Copenhagen with my father and we witnessed bar-fulls of people still celebrating this unlikely triumph. I bought a t-shirt with the message, “Denmark 2 Germany 0” and a flag. I still have them somewhere. My father died a year later. I was also fortunate enough to interview Kim Vilfort, one of the heroes of 1992, a goalscorer and a man who played through difficult personal circumstances in the competition. His daughter, Line, was suffering from Leukemia and during the tournament, Vilfort had to return to Denmark on two occasions. Sadly, Line Vilfort died just after Euro 1992. My interview with Vilfort was published in World Soccer magazine. It followed a game involving his team, Brøndby, and Lyngby. They had just lost 4-0 and virtually handed the Superliga title to city rivals FC København. During the game, I had sat next to Peter Schmeichel and his small son, Kasper. The Zambian under-21 team was sitting behind me, enjoying the sweltering heat. I met Vilfort again a couple of years ago and enjoyed a traditional Danish lunch with him and other football folk. We talked about the domestic game and how Christian Eriksen might fare in England (he had just been signed by Tottenham). Somebody came up to us and shook Vilfort’s hand and slapped him on the back. The man who clinched Denmark’s victory was a little shy and unassuming. He seemed almost uncomfortable. It is something he has had to live with for a quarter of a century – after all, he is a genuine 100% Danish hero. Previous Entry Investing in sport: Opportunity or chance?